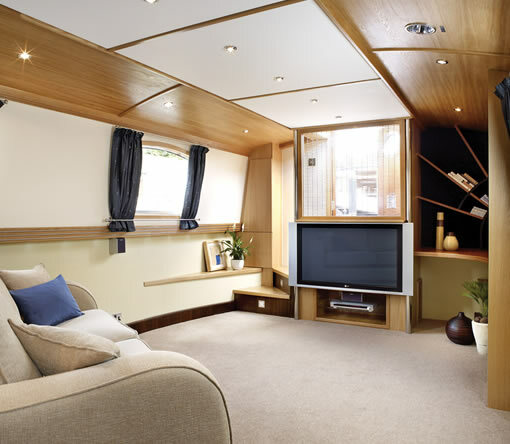 This has been designed to provide the ultimate living space, with plenty of room for the free-standing furniture of your choice, enabling you to relax or entertain in comfort. Entertainment is provided by a built in 42” LG flat screen Television, which provides a focal point for the room, and a Sony DVD Home Theatre (with Surround Sound) System. The study area provides a desk with drawers, and a feature shelving area – it is the ideal place to catch up on office work or just attend to correspondence. Opening windows to both aspects provide plenty of light and enable you to take advantage of the spectacular views when cruising. Recessed downlighters combine with mood lighting to provide the ideal illumination whatever the situation.